Matt C: While I did feel that the Thor: God Of Thunder series lost steam about halfway through, I can't really ignore the fact that someone else will be picking up Mjolnir this Wednesday. 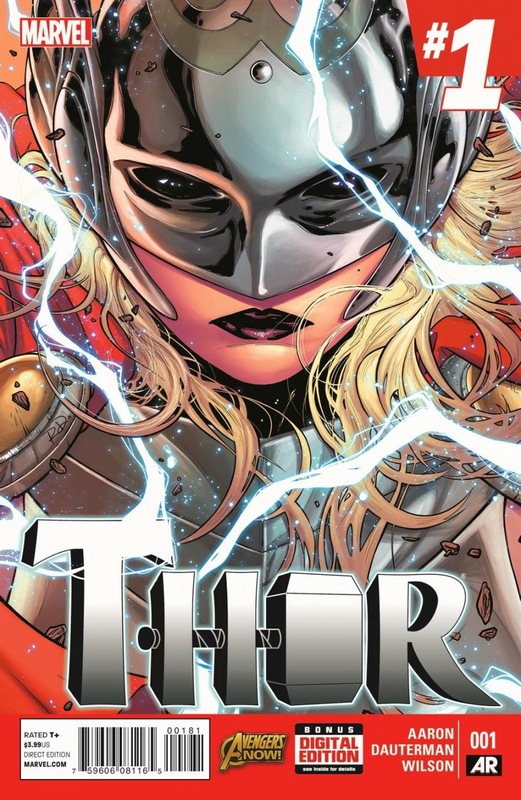 Yes, it's time for 'Lady Thor', the announcement that caused a kerfuffle over the summer. Personally it's all about a good story as it's pretty darn obvious the more familiar Odinson will be wielding his hammer sooner or later, and even though not everything he touches turns to gold (see Original Sin, for example) he's still a fine, fine writer (see Scalped, for example) so I'll be giving the first issue a once over at the very least. I'm much more confident about his Men Of Wrath though, which also sees its first issue released this week via Marvel's Icon imprint. If Aaron does anything better than any other high profile comics writer at the moment, it's pen tales of mean, grizzled, damaged men, and coming so swiftly on the heels of Southern Bastards, I'm very excited to see what he does here. Another debut issue of note is Brides Of Helhiem. The original Helhiem series saw Cullen Bunn mixing up Vikings and the supernatural as successfully as he's blended the Western with the supernatural in Sixth Gun, so I'm really happy to see it return. Gotham Academy #1 is out this week too, but I'm not sure if that's going to be the one to pull me back into the DC Universe. Stewart R: Having not been a follower of Aaron's Thor: God Of Thunder I'd really had no real interest in this latest reboot up until the past month. What's managed to turn me around at the last minute has been the prospect of seeing how artist Russell Dauterman has developed since he was providing the visuals for Supurbia over at BOOM! Studios. Through just a couple of volumes of that series (and I'll add it's one to check out if you like the idea of suburban drama mixing with superheroics!) it was clear to see Dauterman experiment and refine his style to the point where he was indeed ready for the big call, and they don't come any bigger than Marvel. With the up-and-coming artist in the bag there is still also that tug of curiosity hanging over the identity of this newest wielder of Mjolnir and provided the reveal doesn't get strung out in the same manner as it was when Red Hulk first hit the stands - jeez, did that get long in the tooth! - then there's the slightest possibility that I may have another book to permanently add to the pull-list. I'll also state that I'm not certain about the prospects of Bucky Barnes: The Winter Soldier as a post-Original Sin project, not least because I think the actual premise and delivery of this summer's event was trying hard to reach mediocre and failed at even that paltry bar, but with Ales Kot at the helm there's just that tiny spark of interest to see if he can right the ship and bring us something engrossing. So two gambles this week for me then! Thankfully there are some surefire hits in my list too to ensure a good reading experience with Hinterkind #12 marking the year anniversary of that brilliant fantasy series and Rat Queens #8 sure to be filled with banter, battle axes and bloody good times!